Faber’s long term historical financial and economic perspective remains astute. The full interview is a must see and can be seen in our commentary section today. Gold may surge to a record $2,000 an ounce in the next six months as the Federal Reserve’s third attempt at economic stimulus stokes concern that inflation will accelerate, according to TD Securities Inc. 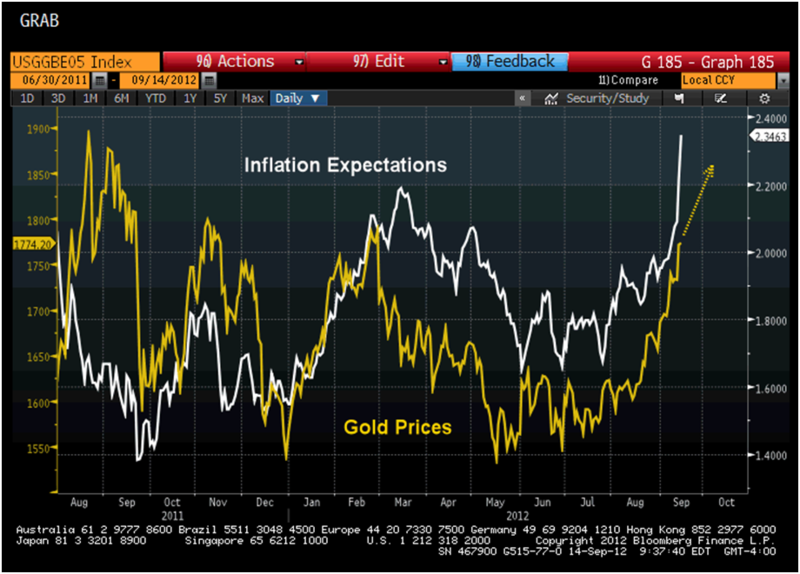 The chart of the day shows that gold prices have moved almost in tandem with inflation expectations, which jumped to the highest in 16 months after the Fed announced a third round of bond buying. Investors may increase purchases of the precious metal to protect against rising consumer prices, said Bart Melek, the Toronto-based head of commodity strategy at TD Securities. Gold soared 70% from the end of December 2008 to June 2011 as the Fed kept borrowing costs at a record low and bought $2.3 trillion of bonds in two rounds of so-called quantitative easing.